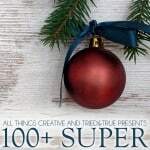 If you read crafty blogs long enough you soon realize that we’re on a bit of accelerated schedule when it comes to holiday projects. Initially, it may weird to see Halloween projects in August or Valentine’s Day crafts before Christmas has even passed but there’s a reason for all of that, I promise! 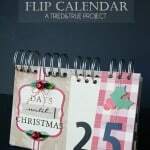 We just want to make sure that you have plenty of time to decide on a project, buy necessary supplies (sometimes online), and then actually make the tutorial. All of that takes time, nevermind if something goes wrong and you have to repeat a step or two. Knowing all that, you’ll understand now why I feel like this Zombie Hands Halloween Wreath tutorial is so late even though it’s only the middle of October. 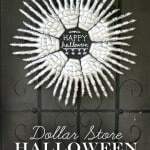 That said, I just couldn’t help but share my new favorite Halloween wreath with you! 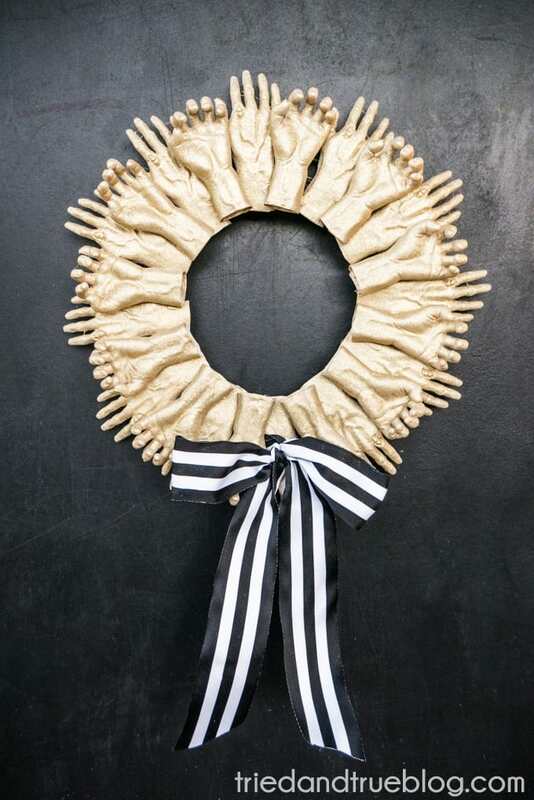 I totally would have made this wreath months ago if I had seen these awesome zombie hands sooner on the Consumer Crafts website. 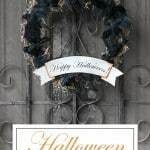 I’m a huge fan of minimal modern wreaths so when I saw these, I just knew I had to turn them into a Halloween wreath. I love how super authentic they look, they even have exposed bone on some of the knuckles and wrists! and helps T&T continue to offer free printables and tutorials! Step 1. Begin by separating the two different types of hands (Flat Palm Out one and Clenched Fingers) into two separate groups. Step 2. Starting with the Open Palm hands, lay them out on the wreath equally spaced apart. 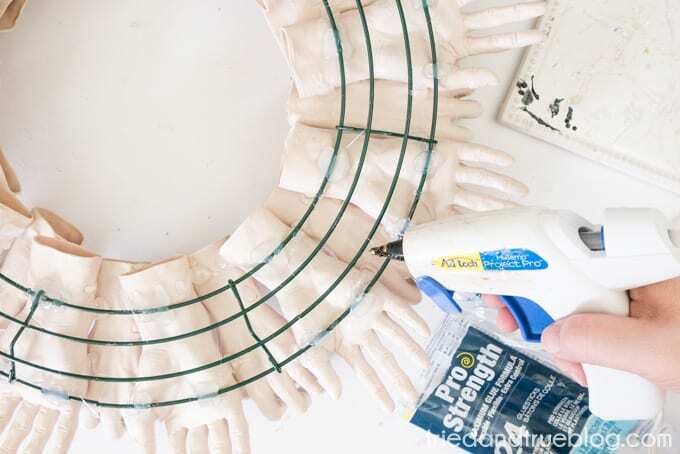 Once all of the hands are positioned, squeeze out a bit of hot glue approximately where the hand meets the wreath and hold in place until secure. Don’t worry if you don’t put the glue exactly in the right place. This is just to hold the placement until all the hands are on. You’ll be adding tons more glue to the back in a few steps! Step 3. 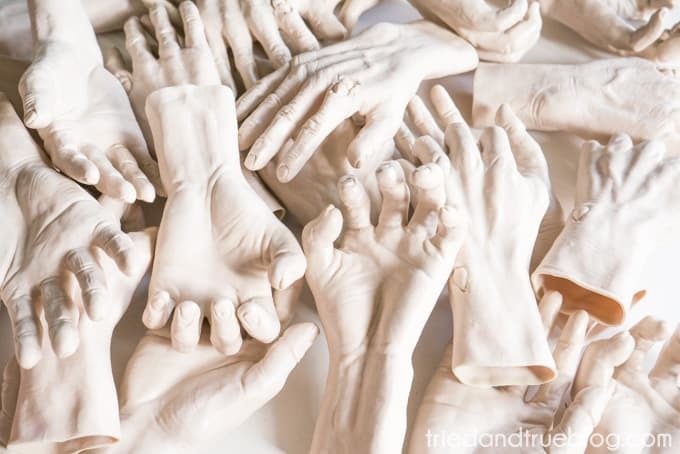 Time to add the second row of hands! Apply a bit of glue to the wrists of the Palms Up hands that are already in place on the wreath and press the Cinched Fingers hands in place. Again, this is going to seem really flimsy but you’ll be adding more glue next! Step 4. Now that all the hands are in place on your wreath, flip the entire thing over and begin applying large dollops of hot glue to the back. Don’t be stingy with your glue, this is what’s going to keep the wreath from falling apart at the first hint of strong winds! Step 5. 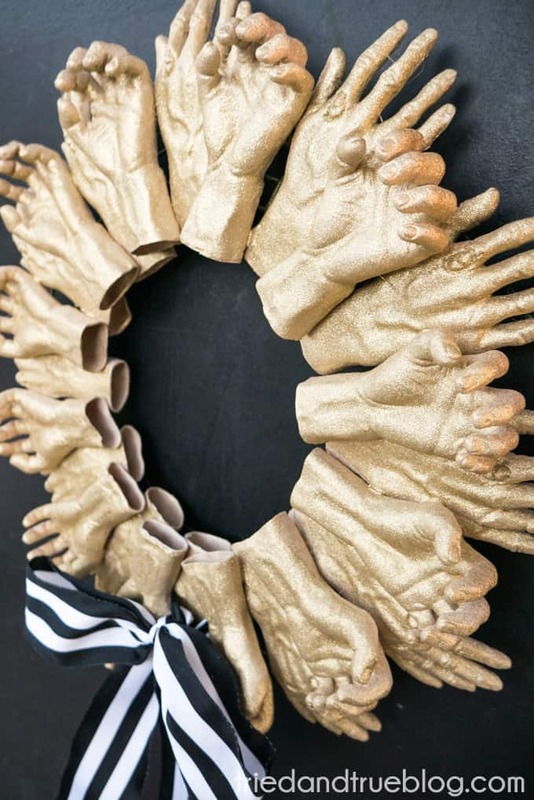 Depending on if you like the look of the bare hands or if you want to make your wreath ultra glam, spray a few coats of gold glitter spray paint over the entire wreath until you’re happy with the coverage. 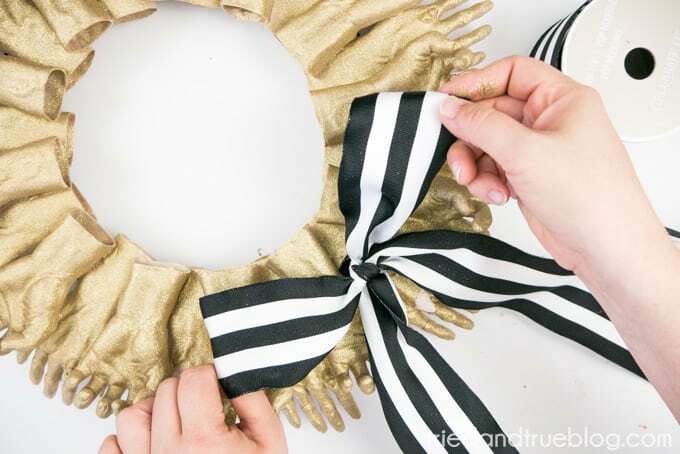 Allow to dry completely before attaching a bow to the bottom of the wreath. 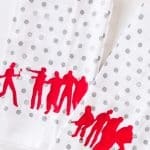 The gaps between the hands makes it super easy to add the ribbon! 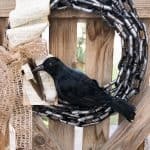 This has got to be one of my absolute favorite Halloween wreaths ever! I love that it looks perfectly normal from far away and that you only see how absolutely creepy it is when you get closer. Zombie hands for the win!